The real key to this play's ultimate success is actors treating everything with all seriousness, and yet they must also possess pinpoint timing in rapid-fire exchanges of lines that are rhyming. Lucille (Amelia Pedlow) is courted by Dorante (Anthony Roach), though she can't be sure he's not a hoax in The Metromaniacs, a new David Ive's play produced by the Shakespeare Theatre Company, as entertaining as anything you'll likely hear or see. Photo by Scott Suchman, courtesy of the STC. Three things we can count on in our lives are taxes, death, and David Ives, playwright and French classics adaptor who sends audiences into gales of laughter. We’ve not seen comedy reach any higher than his redo of Pierre Corneille’s The Liar, which included an imaginary sword fight, something that for me remains a theatrical highlight. He next adapted The Heir Apparent, Jean-Francois Regnard’s classic amusement, and that one had, among its many fine features, a real pig on the stage with talented non-swine creatures. Now comes number three, The Metromaniacs (a title that translates as “poetry maniacs”), which Ives adapted from an Alexis Piron play that otherwise might never have seen another day. With more mistaken identities and disguises than the entire Shakespeare canon comprises, this piece’s humor mostly derives from the real genius that is Ives; he has no qualms updating lines, and yet, he maintains reliance on the rhyming couplet. This may sound kind of archaic but, really, you can have your cake and eat it, because though the lines are spoken in rhyme, the couplets meld into the dialogue so sublime, resembling prose spoken with meter, kind of like this review, only much better. Thus, when you actually hear the rhyme, it doubles the effect of the joke’s punchline. For example, an important piece of the history concerns a shepherdess poet living in Brittany, which is a backward part of France, we hear, where “the chicks, then, carry Brittany spears.” Ouch, you say, but it gets sillier still, for the rustics live in “Meriadec de Peaudoncqville,” which when spoken in straight-forward English, is yet another funny rhyming finish. There is even a joke from young stud Dorante who speaks in rhyming couplets but cannot write poetry. “To dump this delicate play into prose,” Ives writes in his erudite program notes, “would be to clip the wings of Pegasus and harness him to a plow,” if not reduce him to your typical dairy cow, but that same rhyming formula also paves the way for The Liar and Heir Apparent to become such faves. And as with those previous two, be assured, the plot in The Metromaniacs is equally absurd. Ironically, Piron’s original 1738 play is based on a real-life event in his day. That rustic Brittany poetess I earlier referred to was actually a great hoax among the Parisian who’s who, the invention of one Paul Desforges-Maillard (a Parisian poet, not a duck in a barnyard), whose fake poetess was able to ensnare the heart of no less a star than Voltaire. I know, that might seem just a rhyme joke to you, but, believe me, this story apparently is true. The ultimate exposure of this scandalous deception Piron used as the source of his inspiration, writing a farce about the wealthy magnifico who have a great love for poetry and going incognito. The whole play centers on a big to-do being staged at the home of one Francalou, who is, in fact, the mystery poetess of Brittany, which is only one deception among a whole litany. Francalou has written a play with the primary intent of getting his bookish daughter to fall for a gent, inviting to his home one hundred suitors hoping that one them might actually seduce her. Dorante already pines for her—her name’s Lucille—but he’s not invited due to some family ill will, so he shows up pretending to be someone else and ends up being cast in Francalou’s play as himself. Also in disguise is his best friend Damis, a poet who thinks his own new play will make him famous, but in the meantime he is using a pseudonym to avoid his Uncle Balvieau, who is looking for him, mad that Damis pursues poetry and other such frills after Balvieau covered all of his nephew’s law school bills. Damis, by the way, is this plot’s Voltaire, lusting for the mystery poetess, who’s right there, Francalou, smirking and dropping many a vague hint, leading Damis to fall for Lucille by accident. Francalou’s play adds further perplexity, which is really his life presented as parody, with characters depicting people he already knew, such as Dorante, Damis, and even Balvieau, and they are dressed for their parts and learning their lines, encountering each other at the worst possible times. Dressed as Lucille is Lisette the maid, with whom the men now want to get laid. Throw in Damis’s servant, a guy named Mondor, and soon you have mistaken identities galore. One scene alone, between Damis and Balvieau, represents five different identities in just those two. 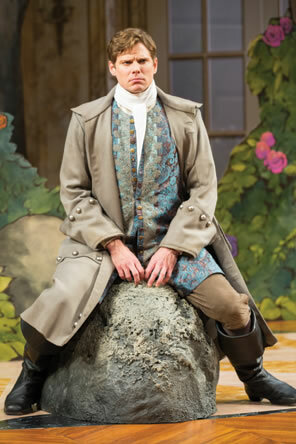 Dorante (Anthony Roach) has a heavy weight on his shoulder, while being a heavy weight on a fake boulder in David Ives' play The Metromaniacs at the STC. Photo by Scott Suchman, Shakespeare Theatre Company. Dorante and Damis, in all the confusion, become intense rivals though still in collusion, and so it comes that these one-time best buds duel with pistols that turn out to be duds. Having brought up that scene, I also must make mention of the boulders in the sylvan set with trees of two dimensions; unveiling this set for Francalou’s play serves as the first laugh in, um, Ives’ play (for it is a silly set, and that’s by design, a credit to James Noone, who, um, did the design). Anyway, those rocks, which are really illusions, are a running joke adding to the characters’ delusions. So caught up in mistaken identities are these guys that no one believes when one drops his disguise. I can’t tell you the ending, not to avoid a spoiler; rather, typical of Ives, the denouement comes out of nowhere. 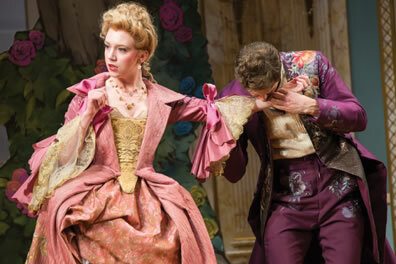 The Metromaniacs is getting its world premiere at Shakespeare Theatre Company’s Lansburgh Theatre, where The Liar and The Heir Apparent made their debuts, which is, no doubt, a most vital clue, for the string of successes these plays prove to be is thanks to Michael Kahn, who has helmed all three. Kahn is the STC's artistic director, who commissioned these works by this adaptor, and they work as a team, Ives and Kahn, rewriting some scenes as they go along. However, Kahn’s greatest skill just might be forming a cast that can play absurdist poetry. The real key to this play's ultimate success is actors treating everything with all seriousness, and yet they must also possess pinpoint timing in rapid-fire exchanges of lines that are rhyming—or, in the case of Lucille with her “whatever” disposition, Amelia Pedlow folds her rhymes into meandering articulation. The Metromaniacs does not quite reach the firmament where resides The Liar and The Heir Apparent, but to say that this one is the lesser of the three is to compare 24 karat gold with 23. For 90 minutes, not counting intermission, The Metromaniacs romps along, even the expositions. “You had to have been there” is all I can say because descriptions fail such a brilliant play, but one thing I can say that is for certain: you need to be there before the final curtain. We laughed—a lot—we had a great time, and I left the theater thinking in rhyme.